This Friday (27th November) shops across the uk will be holding the biggest sales of the year, meaning it’s the perfect time to pick up party dresses, grab gifts and take advantage of tech bargains. Don’t forget you can collect free donations for Wing Village Hall every time you shop online thanks to easyfundraising.org.uk. There are nearly 3,000 shops on board, including John Lewis and Amazon, ready to make a free donation to us – it doesn’t cost you a penny extra. 1. Join – Head to https://www.easyfundraising.org.uk/causes/wingvillagehall and sign up for free. 3. Raise – After you’ve checked out, that retailer will make a donation to Wing Village Hall for no extra cost whatsoever! Thank you for your support this Give Back Friday. The quiz was attended by 50 people, not as many as other years, but we were competing with a function at Manton on the same night. Refreshments were the usually homemade soups and a selection of bite size desserts. Winners of the quiz were Tom and Jane Gilmore and Richard and I collectively known as “Batemores”! There was about ten raffle prizes, so I can’t tell you who got what really, just that it was well supported, as was the bar, which culminated in a final total of £663.00 with all expenses paid. We wonder if sufficient people would be interested in a coach trip from Wing ? We think the coach and admission would be £55 -£60 (no concession’s) It will be non-profitmaking venture. It is a long way ahead, but all we need at present is an expression of interest to see if there is any point getting costings for a coach etc. We would need a firm commitment and 50% deposit in the spring. If interested in more information,please contact Joanne Beaver 737286 or Judith Leahy 737199, leaving your name and a contact telephone number by 10 January. Saturday 12th December at 4.00pm for decorating the hall, laying tables etc. 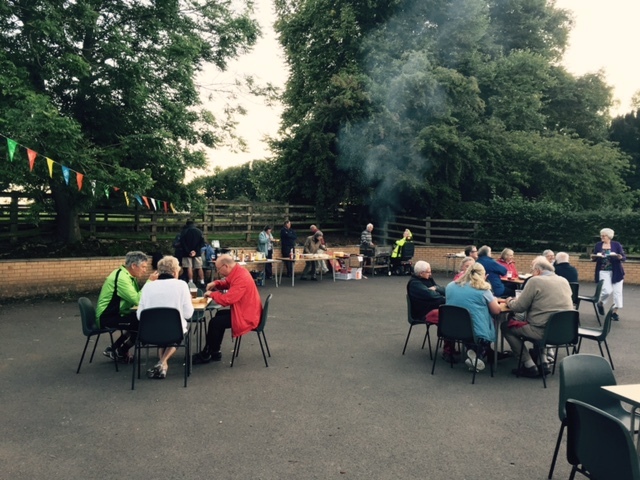 and vegetable preparation and Sunday 13th for serving, clearing and washing up. Please let her know if you can help on those dates. Please contact her on 737475. As is traditional at these events we will be having a raffle. However it is also traditional to ask for prizes to be donated. Any item will be gratefully accepted. Just let Mary Rogers on 737475 or Paul Brewer at Thursday Coffee morning know if you will be providing one . Plucking from the jaws of defeat the village hall committee have been able to recover from the loss of not only Jeanette but Jan, until now organisers of the Christmas bean feast Lunch. If you would like to come and can prove your are senior then please give your name to Mary Rogers on 737475 or Paul Brewer at Thursday Coffee morning. has been booked and the time will be lunch time. Don’t be bashful, come and show your face and enjoy not only good company but some excellent food. If you have the overpowering desire to help, contact Mary, servers are needed. Police in Rutland are appealing for witnesses following an attempted burglary at a home in Main Street, Glaston between 8am and 5.45pm on Wednesday 27thOctober 2015. Entry not gained but crow bar marks found on windows and a door. Police in Rutland are appealing for witnesses following a burglary at a home in Stoke Dry between 11am and 4.18pm on Wednesday 27th October 2015. Entry gained after the glass in the front door was smashed. A valuable statue was stolen. Police in Rutland are appealing for witnesses following a burglary at a home on Main Street in Caldecott at around 2.15pm on Thursday 29th October 2015. Entry was gained via a patio door and a quantity of jewellery was stolen. Four males dressed in grey and black, one wearing a black baseball cap where seen to run to a black Mercedes or BMW estate on false plates, registration number LK63XMZ which was parked on the Main Street. The vehicle then headed off in the direction of Uppingham and then onto the A47 towards Peterborough. TARGET HARDING: With the nights drawing in early please ensure all windows and doors to your homes are checked and secured and that timers switched are set to come on if you are due to return home after dark. If you have any information on the above crimes please call Leicestershire Police on 101. If you see anyone acting suspiciously around property in your area please call Leicestershire Police on 999. Christmas Coffee Morning- THURSDAY 26th November at the home of Jane Peach in Reeves Lane. 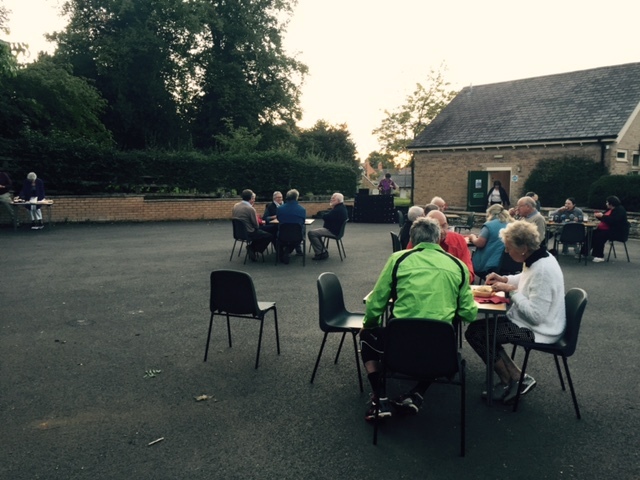 Wing Villagers enjoyed a fine September evening with music and BBQ to celebrate the end of the Ride and Stride and to exchange summer stories. 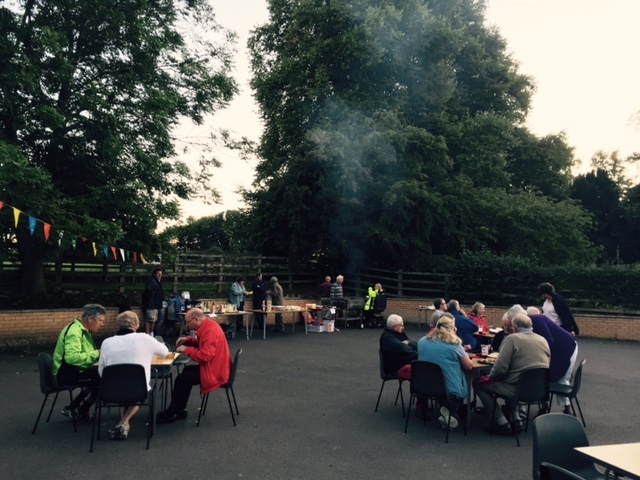 £300 was raised to be split between the Church and Village Hall. A big thank you to all who helped.